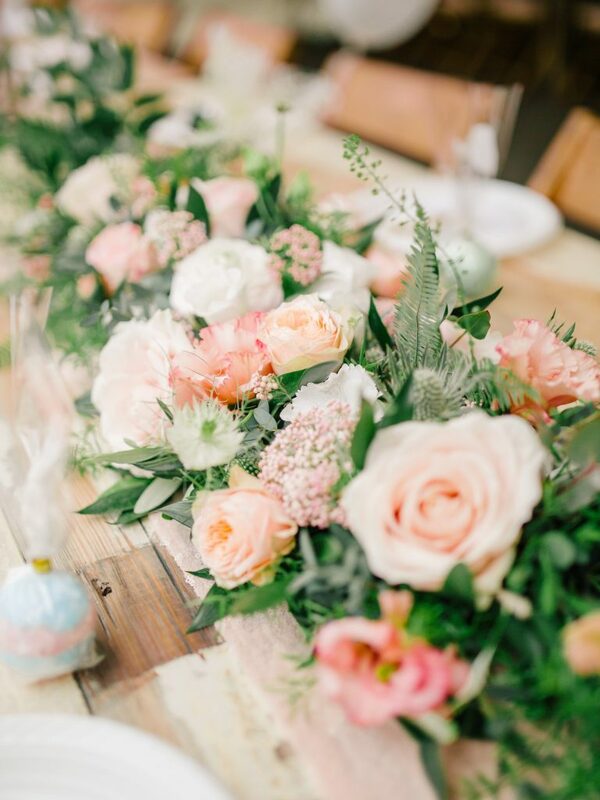 Posy + Wild are a florist, furntiure and home-ware boutique hailing from the beautiful town of Westerham in Kent. I had the pleasure of working with them and absolutely loved their work! They brought my special day to life with use of bright, summery colours that complemented the white and rose gold theme. Lots of pinks, peaches and greenery the outdoor garden party had a warm and inviting feel with the arrangements they created. 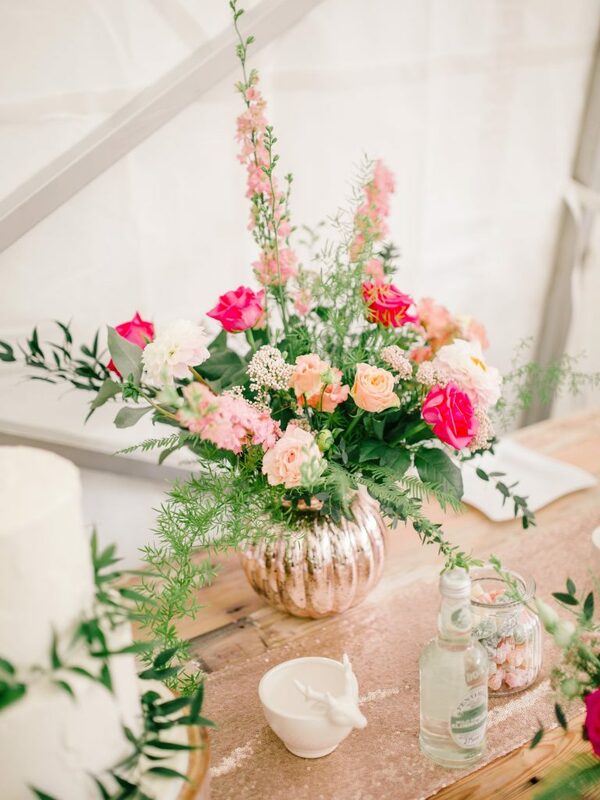 Along with the cake table arrangements that looked stellar in their rose gold vases provided, their crate of flowers display added to the rustic outdoor vibe elegantly. 1. So who are the visionaries behind Posy & Wild? 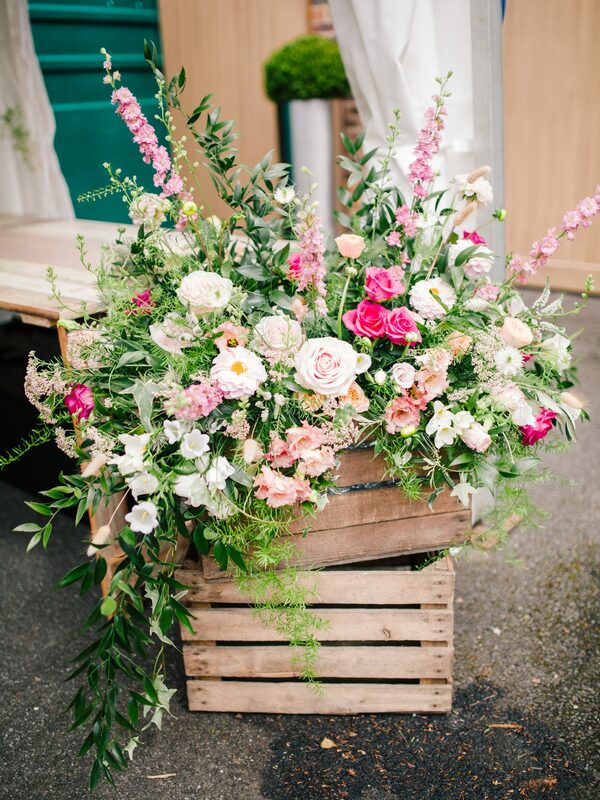 Previously trading as ‘The Sweet Pea’, I designed flowers for weddings & events in Kent and then joined with Coralie in our new venture; Posy & Wild. Coralie and I were intrigued by the similar passions we share and the similar sources of creative inspiration. We are also different in many ways and love being able to harness all of this to bring something special and valuable to Westerham. 2. Where did the name originate from? We love the juxtaposition of styles and wanted our branding to reflect this. Our flowers bring the classic and neat (Posy), to the wild and wonderful (Wild)! 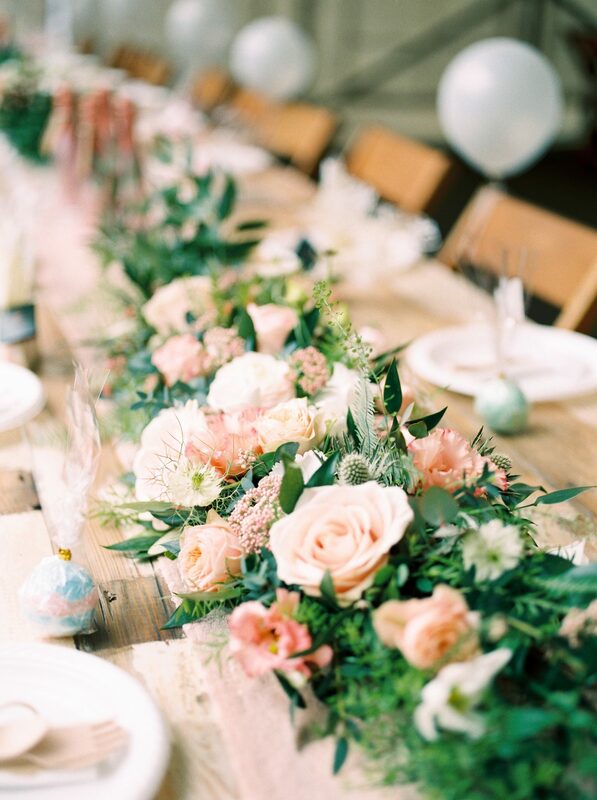 The most rewarding part of floristry is being part of the special events in people’s lives. 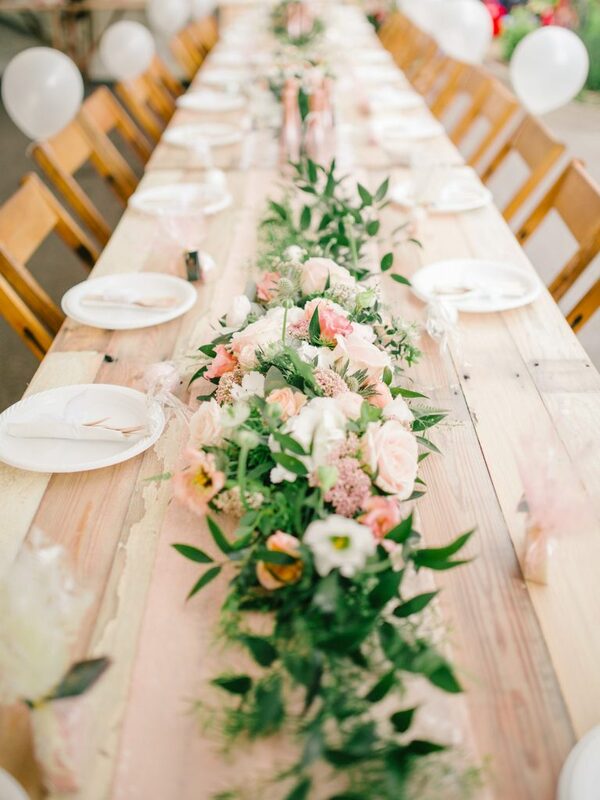 Whether it’s seeing the Brides face when she receives her bouquet, creating one last send off with sympathy flowers or being involved in an extravagant apology! We aim to share our passion and creativity in order to exceed expectations, making sure the final designs are not only stunning, but more importantly, unique to each of our customers. 4. Why flowers – was this always what you wanted to do? Not entirely! We have always had a passion for creating – whether that be painting, photography or music. Starting out as childhood friends attending dance school together, Coralie and I found that floristry was like finding a new way to express our creativity – with flowers being our new canvas to paint on. or are you overcoming them? The biggest challenge is dealing with the unexpected…the last minute anniversary bouquet from a forgetful partner or the colour scheme change for next months wedding! We plan a lot, then a little more and then allow time for those little surprises that inevitably crop up. who want to follow in your footsteps? Follow your heart and trust your gut! Don’t be intimidated by being the new florist on the block. You will be competing with people who’ve been in the industry for ages however, what you may lack in experience you’ll make up for in drive and passion for your company. 7. Is their a quote or mantra you live by as florists/ business owners? 8. Lastly – what inspires you to keep going daily? Flowers and smiling faces! The changing seasons provides a natural rotation of flower varieties, which keeps things fresh and exciting. However it’s the ever-changing requests of our customers and seeing them happy which really seals the deal.